McDonald's is iconic (perhaps the most iconic fast-food chain) for so many reasons — From its thin, piping-hot fries to inimitable chicken nuggets, right down to the restaurant's fan-favorite Big Mac sauce. But though all of these menu items paint a picture in our mind that only McDonald's can claim, we all know the company would be nothing without those classic golden arches that symbolize all things greasy, good and godly. However, there's one place in the world where this isn't the case -- In Sedona, Arizona, the McDonald's arches are painted turquoise. The restaurant, which opened in May 1993, sits in one of the most picturesque cities in the country — Sedona is known for its breathtaking red rock mountains and wide-open skies. But in order to support an economy, even the prettiest of places need infrastructure and business to drive a profit, which is why Sedona is full of restaurants, gift shops and grocery stores alongside its unbeatable nature-scape. In an effort to balance the landscape and retail areas, the city of Sedona put restrictions on building design and signage, including how high buildings could be and what colors the exteriors of storefronts and their signs could be. "We want everything to blend into the natural surroundings, which includes mostly earth tones. The view is really why people come to Sedona." For those not well-versed in aesthetically pleasing color-combinations, the earthy, reddish tones of the mountains pair quite perfectly with the bright, blue-green color. During the time that the McDonald's was open, other businesses in the adjacent shopping center were following a similar aesthetic, and it made sense for the fast-food mecca to follow suit. Due to height restrictions, the blue arches are also situated lower on the front of building than other McDonald's locations. 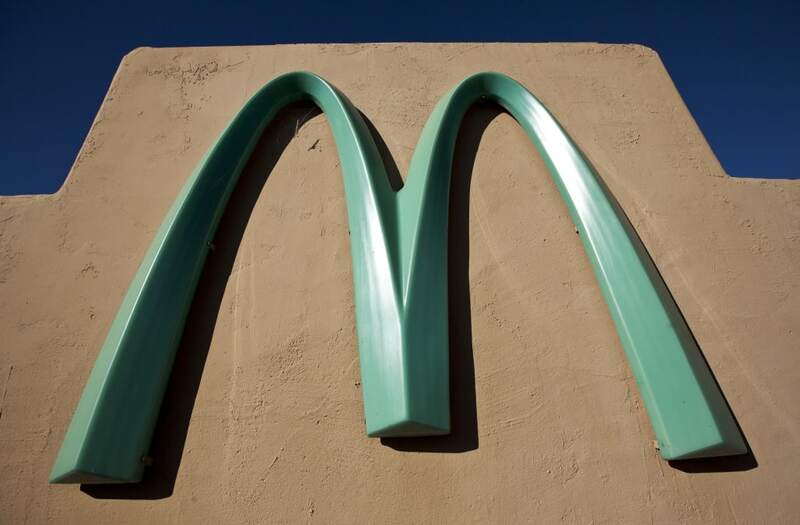 The storefront is located on route 89A in Sedona, Arizona, but don't get your hopes up — the McDonald's is the same inside as virtually every other McDonald's you've ever been to. So if mountain views and nature Instagrams don't entice you, sleep well knowing that a McDonald's restaurant in one of the most beautiful cities in the world is probably photographed (and appreciated) just as frequently as the surrounding landscape itself.